There are many different types of lasers used in dentistry. Some are used on the soft tissues and some on the hard tissues (teeth and bone). Both have many benefits. 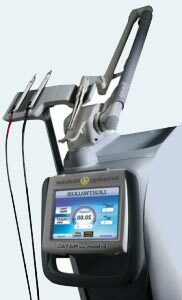 Soft tissue lasers have been available for several decades and are useful for frenectomies, tongue ties, gingival procedures, etc. Lasers have made these procedures much easier to perform as well as decrease healing times. “get a shot”. What kid isn’t going to get excited about that? The second benefit is that the parent does not have to worry about their child being numb for several hours after the procedure. The patient has the ability to eat, go back to school and return to activities as normal immediately afterwards. No more worries about your child chewing on their lip or tongue. At McClure Pediatric Dentistry, we utilize this technology to provide the best care possible for our patients. We offer dental sealants, tooth colored fillings, silver crowns and tooth colored crowns. With larger cavities, pulp therapy may be needed. There are many options and we will always discuss these with you to make the best decision for your child. Children’s teeth should be brushed twice daily for at least two minutes per brushing period. Parents should help their children brush their teeth until ages 6-8, depending on the ability of the individual child. The most common interval for professional cleanings is every 6 months, although some conditions may necessitate more frequent dental visits.